This book was very helpful. Read it twice in the first week and will read it several more times. Have referred it to a few friends already. The author spends time, through actual clients of his, showing the different symptoms by which ADD manifests itself and then gives good concrete methods to combat the negative aspects. Good information but a lot has changed since this was published. My husband was recently diagnosed with ADD. I found this book very helpful in understanding what he is going through and to see how it has affected me as well. This book is the right mix of informative but not too scientifically based to feel like a textbook. WOW! Very insightful. Gives a clear vision into the person with ADHD! A must read if you think you be, or think you are living with someone who might be ADHD. This is a brief overview of ADD/ADHD. I was hoping for many more tips on the subject, but also realize this was one of the first books to appear on the subject. If you looking for a overall general info, go for it. But if you need something more detail oriented and practical, this is not the book for you. 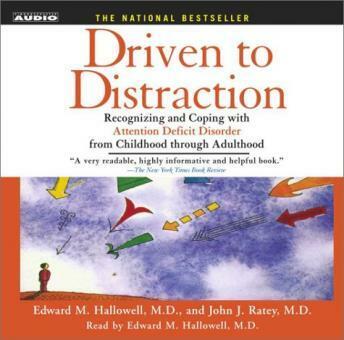 This book was very helpful since my son was recently diagnosed with ADD. I would recommend this book to others to understand that there really is such a disorder as ADD and once diagnosed you can live with it successfully. After reading the book I felt relief for myself because I too have been diagnosed with ADD. Really good read. I lent this to my father and brother before I returned it. We all found it very insightfull. Very good reference book written by a physician with ADD. It is must book for people with ADD or family with ADD person living with them.